Bulcomon's Ultimate has finally appeared in Digimon Encounters, the Chinese mobile game. Bulcomon was introduced last year as the mascot character of Digimon Encounters, and going back as far as his initial introduction, they teased his Ultimate form via silhouettes. We finally have a good look at him, and he looks like a pretty big ice warrior. A profile shot of him. We don't have a Japanese or English name for him yet, but going off the Chinese characters that make up his name, 冰空领主兽 and going off other Chinese Digimon names, then converting to roughly what the equivalent Digimon name would be in English, it appears it would end up 'something' akin to LordIcemon. Interesting looking Digimon, hopefully we get some larger images soon! Thanks to Ulforce_Soul for the images. Nice, he’s like an ice crystal version of Crimson Mode. Dank. I'm not sure what its Japanese/English name will end up being, but its Chinese name literally means: icy sky (冰空) lord (领主) mon (兽). Last edited by YongYoKyo; 03-15-2019 at 12:13 AM. I'm not sure what its Japanese/English name will end up being, but its Chinese name literally means: icy sky (冰空) lord (领主). I spoke to someone who told me 'ice sky' written like that would work decently as just 'ice' without further additions. The name formation itself I based by looking at various Digimon names that had similiar elements in Chinese and looking at their Japanese/English names to come up with a rough equivalent. 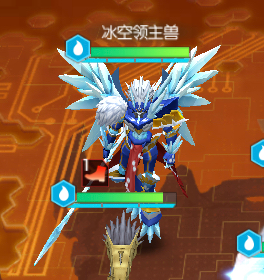 Obviously there is a good chance that LordIcemon, IceLordmon (or even throwing in sky there also) will likely 'not' be the Japanese/English names we get, LordIcemon is just something reasonably clean to call him for now 'based' on the Chinese name. Just to explain my thought process in getting to the stand in name. It came so much quicker than Herissmons lol. Don't really like it tbh. Last edited by Muur; 03-15-2019 at 02:12 AM. All hail lord icemon may his reign be cold like justice!!! Also weird that he is no longer a dragon, I guess. dropped the Dra- and the Draco parts. I wish I could see it better, it's hard to form an opinion from such a vague image. Hopefully soon we'll see it properly! I like that he has an Epaulette on his left shoulder. Gasp... Wait Bulcomon's Ultimate form, IceLordmon didn't have Dra or Dragon thingies? 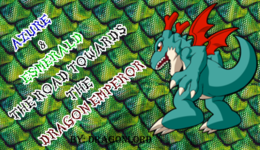 Although he is Ice Dragon? Wow. Like Guilmon's!